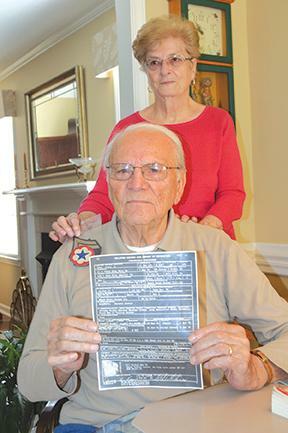 World War II veteran Jerry Dean displays his wartime orders along with wife Mary, who holds the "clearance patch" that gave security clearance for her husband to perform super sensitive duties at "Secret City." SECRET CITY - When President Franklin Roosevelt asked U.S. Sen. Kevin McKellar if he could "hide $2 billion" in the mountains, the East Tennessee lawmaker replied: "Mr. President, you know I can!" That launched a secret government project in the early 1940s that not only changed world warfare history, but supplied jobs to the largely-unemployed post-Great Depression population of the Appalachian Mountains. Murfreesboro resident Jerry Dean, now age 92, was one of those East Tennessee residents who secured a "top secret" job in 1942, at Oak Ridge, where some local folks dubbed it "Secret City." "None of us knew what job the other person was doing, if they worked outside our specific crew," the Army veteran recalled as Veterans Day 2014 approaches. "If you asked another worker a question, most often the answer was 'I don't know.' You got a lot of 'I don't knows.' We all had signed agreements, not to discuss with anyone what we were doing." Metal crew supervisor Dean recalls wondering if he would need special welding rods to deal with some stainless steel fabrication: "We were working in the highly secretive Y-12 unit, so our work had to be accurate. But when I asked my director supervisor, if we needed specialty welding rods, he responded: 'I don't know.' My request went up on the chain of command, through two more 'I don't knows' before we finally got our answer. We used the same welding rods we had been using." Married couples were "ordered" there was to be no "pillow talk" with spouses. "We were told to discuss nothing with wives, family and friends," Dean recalls. At its peak, Oak Ridge (Secret City) and Anderson County bulged with more than 75,000 people for the development of the project now known globally as the "Manhattan Project," ... a project designed to end World War II. Dean arrived at "Secret City" knowing only that he was to "supervise" a six-member metal fabrication crew. Due to his specialty, he had a master badge that cleared him to enter any area of "Secret City" that had three main security gates from the outside world. "I had been trained as a black carbon machinist with the Tennessee Eastman Corporation," Dean recalls. "Upon arrival, our work building was intact, but the equipment had not arrived." So initially, Dean drove a 25-passenger bus. 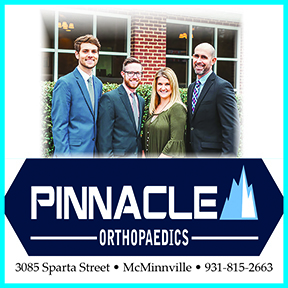 "For six weeks, we drove prospective employees to and from nearby Knoxville, twice-a-day," Dean accounted. But, for some East Tennesseans, there was more than drama merely about "top secret" jobs. "Some of those Anderson County people had been forced to move three times by government projects, starting back in the 1930s with the development of the Smokey Mountain National Park, then they had to move with construction of a big TVA (Norris) dam and lake, and then, they had to vacate their land again there in the valley of Anderson County," machinist Dean constructed back in time. "There was some resentment and adjustment, but then, most everyone seemed glad to have jobs," Dean added. What was his biggest memory from "Secret City?" "We had one building in K-25 area that covered 48 acres," Dean detailed. "At the time, it was the largest building under roof in the world." "There were lots of female employees," Dean added. "There were no concrete sidewalks, so many females toted two pairs of shoes ... one pair to handle the mud and wooden plank walks ... and one pair to do their work. It was either a lot of dust, or a lot of mud." "There were dormitories for men and for women," Dean accounted. "We bunked two to a room. "The cafeteria was another huge building," Dean shared. "The only building I recall with metal siding was the administrative building." Dean worked two years at Oak Ridge, before finally deciding to leave the top secret facility. "I kept getting draft notices from the board back in Kingsport," Dean shared. "I had already got four 6-month deferments, and was told it would be no problem to continue getting deferred from the draft. "By this time, I really wanted to go into the Army, and be a part of the wartime experience," Dean recalled. After accepting the draft, Dean was placed in the Army's "Railroad Battalian" that ultimately was stationed at Nuremburg, Germany, in 1945. "Allied Forces bombs had flattened just about all of Nuremburg in the march to defeat the Germans," Dean added. "The only government building left standing was the Nuremburg Courthouse that became globally known when the Nazi war criminals were later put on trial." Dean recalls where he was on Aug. 6, 1945. "I know where I was standing upon hearing of the atom bomb being dropped on Hiroshima, Japan," Dean accounted. "And that's when it came to clear to me, for the first time, what I had been working on back in Secret City, Tenn."
"I'm told, residents of Nuremburg began celebrating, cheering out of windows, celebrating the news that a 'Big Bomb' had been dropped on Hiroshima," Dean added. "We all seemed to know the dropping of the atom bomb meant the end of WW II was nearing." Dean and his wife, Mary, along with a group from the downtown Murfreesboro First Church, recently toured Oak Ridge, the first time he'd been back to "Secret City." "It brought back a lot of memories," Dean declared. While detailing his secret wartime duties, Dean shared a note on White House stationary from then Secretary of War Harry Stimson: "To you who answered the call for your country and served in its Armed Forces to bring about total defeat of the enemy, I extend the heartfelt thanks of a Grateful Nation."